Supreme Air provides Air Conditioning, Heating and Plumbing Services, Repair, Installation, Maintenance, and Tune Up in Columbia, MD and surrounding areas. Thank you Michelle for taking time to submit this review. We enjoy providing our customers with such great service and appreciate you letting us know that we did. We're really looking forward to our next visit and hope you have a supreme day! Thank you for submitting this review. We are so happy to hear back from you regarding your annual service and glad we could get your air conditioning serviced before the hot weather comes. We're looking forward to our visit in the fall for your heating system check up. Have a supreme day! Phil is professional with a deep understanding of the hvac system. I wish other companies had more professional personnel like Phil. Thank you for taking the time to leave a review. We are thrilled that Phil was able to provide you such excellent service and look forward to continuing this in the future. Have a supreme day! Unfortunately, the day the repair was to take place, the repairman had an emergency, but we were never informed. He was supposed to show between 8-12, and by 11:45 I called to find out his status and was told he had an emergency and they needed to reschedule for another day. When I told them our instant hot was leaking, he finally did arrive much later that day. The entire system had to be replaced and the estimate was almost $800. We were able to find the replacement part for $250 and with labor from the first day and then his return visit to install, the entire amount was about $500. I understand they have to order all the parts, whereas I just ordered the main part, without the faucet, connection parts, etc. Derek was very good, however, and pleasant to deal with. Thank you for taking the time to leave a review. We value and appreciate your feedback. I do apologize for any inconvenience this caused you. Should you have any questions or concerns please do not hesitate to reach out to us. Thank you for being a Supreme customer! Thank you very much for your kind words! We are thrilled to hear we made a positive impression on you. We look forward to working with you in the future! Have a Supreme day! Staff got here when they said, they clearly explained what was wrong and fixed the issue. They came right after a snow storm so really appreciated that. Some things will need a new part; but they will come back and fix at no cost. Supreme Air is an amazing commercial partner. Great Job Supreme Air !!! Thank you very much for your kind words. We truly appreciate and value your amazing feedback! You are a Supreme customer to work with! He was very courteous and professional and explained everything. On arrival checked thermostat was calling for cooling. Measured return temperature, supply temperature, amps, voltage, and capacitor. Inspected electrical connections, filter is clean, blower wheel is clean, evaporator coil is clean, used a vacuum to clean condensate drain line, and contactor is ok. Customer Stated that she will let us know when sheâ€™s ready to renew service agreement. Unit is operating normal at this time. Upon arrival I was told that unit was cutting on and off. Found system low in 410a and shutting off due to low pressure switch. Performed leak search with electronic detector and bubble soap. Found leak at Evap coil. Customer not sure if extended warranty will transfer. Quoting her to replace if itâ€™s not. Uploaded pictures of indoor coil and indoor data plate. Outdoor unit states 10lb of 410a, probably 11lb total. Office please follow up with customer. On arrival checked thermostat was calling for cooling. Measured EWT,LWT,EWP,LWP,amps,voltage, and capacitor. Inspected electrical connections,blower wheel is clean,evaporator coil is clean,electronic filter is clean, used a vacuum to clean condensate drain line, and contactor is ok. On the mini split system I measured amps and voltage and also cleaned both filters. Found outdoor unit not coming on, I reset system and unit is operating normal at this time. Customer renewed service agreement, paid full amount $327.69. On arrival checked thermostat was calling for cooling. Measured return 69.1 degrees,measured supply 55 degrees, measured amps, voltage. Inspected electrical connections, evaporator coil, blower wheel is clean, filter is clean, contactor, and capacitor. Recommended a uv light. Checked in with store manager and called BAS. Secondary supply air sensor had rusted out at the crimped connector. I was advised to fix this, however it turned out that the sensor was bad. While doing this the phase monitor alerted and turned the unit on standby. BAS has me read line voltage across l1,l2&l3 and then temporarily bypass the phase monitor. BAS to mail to Hobby Lobby store a replacement phase monitor and temperature sensor. Once the parts are at the store they will generate a ticket to come and replace. I then checked sensor readings of the unit while on the phone and went in to the room sensor and they set a differential on it from their end and will see if it holds up. Checked out with BAS and had store manager sign the iPad and paperwork. Upon arrival I was told that thermostat was reading error code since the weekend, customer was trying to run ac. Found thermostat reading AC communication fault. Found Yellow communication wire disconnected/slipped out of terminal block. Reconnected wire and then returned power to unit, system came on normally and fault went away. Performed pm on carrier ac unit. Found filter is dirty, customer needs to replace. Flushed out drain. Inspected cleanliness of both coils and blower wheel. Checked all electrical connections and made sure they were tight. Ran ac. Measured amp draw of compressor, od fan, and indoor fan. Checked delta air temps at both coils. Unit is operating normal at this time. On arrival checked thermostat was calling for cooling. Measured return and supply, amps, voltage. 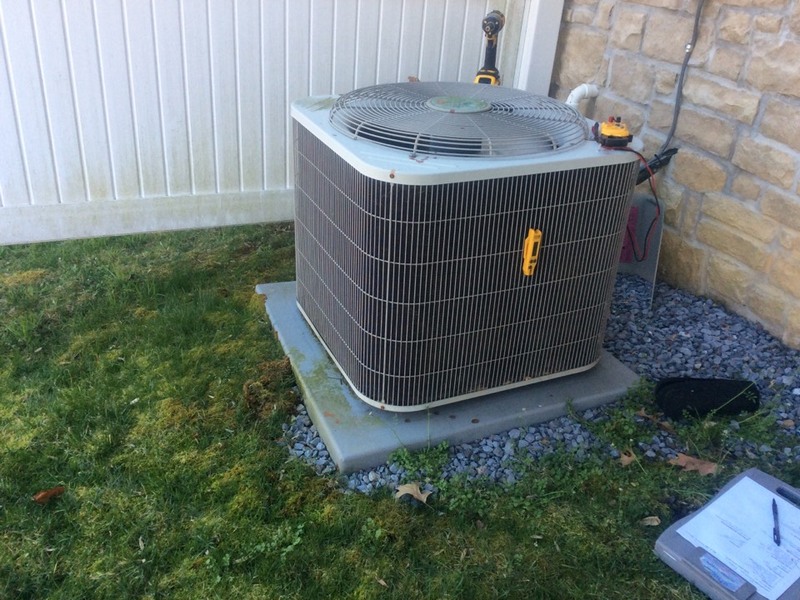 Inspected electrical connections,blower wheel is clean, evaporator coil is clean,replaced filter provided by customer,clean condensate drain line, inspected Contactor and capacitor. Customer renew service agreement $199.92,paid in full.unit is operating Normal at this moment. I ended up replacing the thermostats and elements for the hot water heater. Refilled with water and made sure they were pulling amps and heating up the water. Unit operating normal. Spring Pm on 04/01/19 On arrival set unit to call for cooling measured supply and return air temp measured voltage and amps inspected electrical connections checked drain and cleaned checked filter is cleaned checked condenser unit checked electrical connections checked voltage and amps checked coil cleaned checked pressure checked capacitor units tested units operating normal at this time. Use Aprilaire upgrade kit to replace old filter. The old accordion style air filter was an odd size and the electronic air cleaner did not work because the strings were all broken. I used an upgrade kit to install Aprilaire #413 filter. Now the customer can easily check and replace the filter. I cleaned the condensate pan and drain lines. I checked the electrical wiring and electrical systems, all are within specification. The unit came wired from the factory with a start assist for the compressor. Unit cooling with 20+ degrees across the evaporator coil. Unit operating normal. I recommended adding a Blue Tube ultra violet light. Customer paid with a check, which I mobile deposited, but because of low WiFi connectivity I donâ€™t think itâ€™s processed. On arrival checked thermostat was calling for cooling. Measure EWT,LWT,EWP,LWP,measure return and supply temperature, amps, voltage, electrical connections, contactor,blower wheel is clean, and I also replace filter(30x32x2). Unit is operating normal at this time. I cleaned the condensate pan and drain line. I confirmed proper flow rate and heat of rejection. I pressurized the ground loop to 65psi. I checked the electrical wiring and electrical systems, all are within specification. Customer complaint of a loud auxiliary heat contactor, which was fixed by tightening it to the cabinet. Filter was recently replaced by the customer. Unit operating normal. I recommend adding a whole house surge protector to the main electrical panel. I sent the customer information regarding Symphony WiFi and I made estimates for both. I cleaned the drain line which was actually clogged. I recommend adding either an EZ Trap or a Wet Switch as a means to stop the unit from running in the event the drain line clogged again. I operated the unit on cooling mode and recorded 20+ degree delta temperature. I checked the electrical wiring and electrical systems, all are within specification. I recommend adding a Hard Start Kit to the compressor because it is a reciprocating drive and given its age. Besides repairs recommended, the unit is operating normal. Customer asked for an estimate but cannot make the repairs at this time. Costumer has multiple units with blank thermostats. Checked power in three units all with 210 volts and 24 volts leaving control board . I was not receiving 24 volts at thermostat. Costumer set off the fire alarm before we got here . I found the smoke detectors were breaking the 24 volts to thermostats. Costumer has to call the Alabama co pans to reset the panel. On arrival checked thermostat was calling for cooling. Measure temperature coming in and going out. Inspected electrical connections, measure amps and voltage, voltage absorption system, contactor. Also recommended to have their duct clean. Customer wanted a quote. Upon arrival I was told that HeatPump portion of water heater wasnâ€™t working properly. During diagnostics I pulled up previous fault codes and found none. Then I ran HeatPump only portion of water heater and checked operation. Normal delta air temp across Evap coil. 10degree Superheat, in spec. 130degree discharge temp. Unit uses 134A refrigerant. Continued to run and water heater is operating normally without fault. Customer said she could hear unit beeping from time and time and isnâ€™t sure why. I informed customer to write down any fault codes if they appear in the future. For now, water heater is operating and working normally. On arrival checked thermostat was calling for cooling; measure temp coming in and going out,filter is clean(14x25x1), AMPS,voltage, voltage,electrical connections,absorption system rated for 7.5, actual 7.6(indoor) Outdoor unit, rated for 35mfd, actual 35. Unit is operating normal at this time. Customer paid over the phone. Install conversion kit and replace gas valve. Replaced gas valve and installed conversion kit. Had to call tech support because it wasnâ€™t clear what to do with gas valve wires. Spoke with tech support and confirmed connections. Checked all wiring and piping. Restarted unit and checked heating operation. Measured gas pressure and heat rise. Measured amp draw and let thermostat satisfy. Unit operating normal.